As we head toward summer, nights grow ever lighter with the deepest level of darkness; known as astronomical twilight, absent until early August. The duration of the three ’twilight zones’ continually change from mid northern latitudes, but is perhaps most noticeable around the solstices - particularly the summer solstice. Using the evening as an example, following sunset civil twilight exists until the Sun drops six degrees below the horizon. After this point normal daytime activities cease to be possible and ‘lighting up’ time occurs. The next level - nautical twilight - exists when the marine horizon is no longer apparent, by which time the Sun is around twelve degrees below the horizon. In the sky only the brighter navigational stars are visible. When the Sun drops 18 degrees below the horizon all the fainter stars become visible and astronomical twilight commences (true darkness). 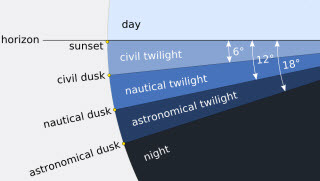 During our summer, when the northern hemisphere is inclined towards the Sun, after civil twilight ends, nautical twilight persists throughout the night, with astronomical twilight totally absent. The Sun’s apparent journey below the horizon is relatively shallow and around the summer solstice period even nautical twilight barely exists, the Sun barely dipping 13 degrees below the horizon. The further north one travels the lighter nights become, until at latitude 67 degrees N (the Arctic Circle) twilight is completely absent for the duration of summer. Here from the land of the “midnight sun” stargazing is very much limited, to just one, the Sun itself?